A modest suggestion- the best New Year resolution is to shop more at the market. More local businesses in one spot, great tasting food that is good for you too.Stock up for the New Year’s celebrations at the wonderful Wednesday market. Full Circle Bakery has the best bread for french toast -cinnamon brioche…..
John Rizzi will be there will beautiful hand-blown glass ornaments. Market gift certificates – got some hard to buy for people on your list the market git certificate is great choice. OMG you cannot miss this Saturday’s market.. It’s customer and vendor appreciation day. Fun, prizes and food. All to say thank you to the folks who keep this market great; our wonderful loyal customers and our farmers, ranchers, crafters, cooks and more -all the vendors that make this the best market in Sonoma County. It’s also procrastinators day. The market has many possibilities for great gifts including market gift .certificates.. There are lots of special foods only available this time of year, sweet tamales from Mi Fiesta, panattone from Costeaux French Bakery. 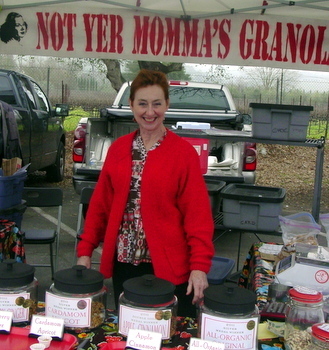 And Not Yer Momma’s Granola is back! This Saturday the market says thank you! On Saturday, December 20, the Santa Rosa Original Certified Farmers Market hosts a Customer and Vendor Appreciation Day. It is a way for the market to say thank you to everyone involved in the market for helping make 2014 a success in the market’s new and likely permanent home on the west side of the Luther Burbank Center for the Arts. Several market vendors will contribute to a buffet table filled with nibbles, offered to anyone without charge. Among the selections will be paella from Cesar’s Bone Broth; vegetable soup from Zuppa; artisan breads from Costeaux French Bakery, Full Circle Baking and Raymond’s Bakery; Ann’s Pesto Pasta from Willow Designs; Min Hee’s green salad and much more. Hourly drawings will pair a customer with a vendor for special discounts, an effort to introduce customers to unfamiliar vendors. Oliver the Balloon Guy, dancers and musicians will also participate in the fun. The buffet will probably get started about 10 a.m., after the first wave of serious shopper who arrive right at 8:30 has ebbed. As of press time, it was impossible to share for certain exactly which farmers would participate, as many fields were still flooded and growers had yet to assess their crops. Some who farm in low-lying areas could be done for the season and those who sustained wind damage may or may not be ready to return. Even so, it should be a bustling market, as the Saturday markets before a major holiday always are. There will be plenty of winter greens for salads, soups, stir-fries and braiseds; all manner of root vegetables, from carrots, radishes and beets to potatoes, sweet potatoes, celery root, parsnips and the unusual yacon, which EarthWorker Farm has begun harvesting. There will be plenty of citrus, walnuts, almonds, pomegranates, persimmons, apples, apple juice, fresh flowers, dried flowers, salad greens, organic spices, spice blends, organic farro, local shell beans, shallots, onions, garlic, mushrooms, winter squash and a few straggling remnants of late summer and fall. There should be eggs, too, though remember that many hens stop laying at this time of year; if you need eggs, shop early or risk disappointment. Not Yer Mama’sGranola attends and now offers its delicious blends in bulk. Salmon Creek Ranch attends this market with their popular duck eggs, pet treats, goat and beef. Other protein vendors include Pepper Ranch Poultry;l John Ford Ranch, which has beef; Oz Family Farm, which has rabbit; Bellwether Farm has delicious cheese and voluptuous yogurt and Williams Ranches, purveyors of outstanding lamb. The market has great coffee, fabulous teas from Pure Puer-and many delicious foods to enjoy on the spot. At this time of year, they typically have more than the usual number of craft vendors, too, which makes for great holiday shopping. However, some craft vendors do not attend if it is raining, as their products are often vulnerable to water damage. There are several more markets before Christmas, one in Sonoma Valley on Friday, two others in Santa Rosa on Saturday morning–Santa Rosa Community Market at the Vets Building and the Oakmont Farmers Market in Oakmont–the Sebastopol Farmers Market on Sunday and both the Santa Rosa Original Farmers Market and the Santa Rosa Community Farmers Market on Christmas Eve morning. There is plenty of time to put together an all-local holiday meal, no matter what it is that you celebrate. The market is currently managed by Pegi Ball of Pegi Ball Catering, who assumed the position on November 1, after Jaimes Smedes resigned. The Santa Rosa Original Certified Farmers Market, founded in 1978 takes place from 8:30 a.m. to noon on Wednesdays and from 8:30 a.m. to 1 p.m. on Saturdays year round in the west side parking lot of the Luther Burbank Center for the Arts, 50 Mark West Spring Rd. The Redwood Empire Food Bank’s goal is to end hunger in Sonoma County. 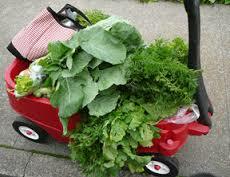 innovative programs, they are able to offer fresh fruits and vegetables. ending hunger in Sonoma County. grown. We are doing our best to share what we grow. Let’s tackle this problem year-round. We urge everyone to get involved in ending hunger in Sonoma County. This is a year round rain or shine market Tomorrow is one of the shine days. You can have a bite, stock up for the week and even do your Holiday shopping. Hector’s Honey still thinks its summer –he had watermelon and tomatoes! Before the next big storm comes in, stock up at the well-stocked Wednesday market. Now Open until one pm. This week seafood is back at the Wednesday market. Line caught Alaskan salmon and local crab! Thank you to everyone who has been wishing and dancing for rain. You did it, the storm door is open. Tomorrow just in time for the market, there is going to be a little break in the rain. Saturday December 6th Vendors list.